Experience Cuong Nguyen's distinctive portrait process through one of these in-depth demonstration videos. When you purchase a streaming version, you can view in full HD on Apple TV, Roku, and Chromecast, on your Android or iOS mobile device, or in any web browser. You'll also be able to download the video for local playback. This beautiful demonstration, with nearly four hours of instruction, teaches you how to create more realistic portraits in pastel pencil using Cuong's distinctive yet easy-to-follow green foundation technique. The demonstration begins with an overview of the materials and skin color test that explains Cuong's color layering approach. 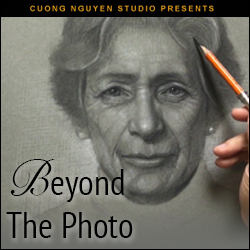 Then, Cuong is joined by a live model, and he talks you through every step of his portrait from initial drawing through to final results. Handy color chips appear on-screen to tell you exactly what color Cuong is using at all times. Also included is a bonus video that explains preservation and framing of your finished work. Whether you're experienced with pastel pencils or new to the medium, this video is sure to provide you with tips and inspiration that will bring your work to the next level. English with English and Spanish subtitles. Prefer DVD? : A DVD release of The Glowing Portrait will be available soon. If you'd like to sign up to be notified when it becomes available, click here. Understanding that we can't always rely on the presence of a live model for the entire drawing process, artist Cuong Nguyen demonstrates how to use a photo reference effectively in creating an expressive portrait. He uses a crosshatch technique with charcoal pencils and white chalk, and explains his decision process for adapting and highlighting details from his source photo. Includes over three hours of instruction. All images copyright Cuong Nguyen. Do not use without permission.